The vinyl wave is here to stay. We observed flourishing record shop trends just years ago; now we need only reference the burgeoning turntable/player scene for corroboration. And what fascinating finds. Manufacturers are servicing younger, more connected audiences with smartphone controls, or spoiling homeowners with stylish, elaborate setups. We trawl the offerings to bring you 5 pieces you can consider furnishing your pad with. Go all out on bringing retro back into your abode with this literal standalone piece. Resembling a tuner from 60s (when speaker grilles dominated), the Sterling is styled as a turntable with aux-in but in fact has a set of dynamic, full-range speakers. It works with 7-, 10- and 12-inch records at two speeds, 33 1/3 and 45 RPM. Only the green and cream colour variant, pictured here, is still available on Amazon. $153 before shipping. For the record – these are typically different products. Both play your vinyls, but a turntable (traditionally) needs additional systems to produce meaningful music, whereas record players come with speakers (or the oldschool ‘horn’) capable of filling the air with those rich notes. Those who have invested into professional sound systems may favour turntables – which often are engineered to produce the highest-fidelity signals possible. Do note that when shopping online, the terms tend to be interchangeably used (simply because ‘turntables’ is more widely searched.) Be sure to check on whether speakers (and pre-amps) are present. 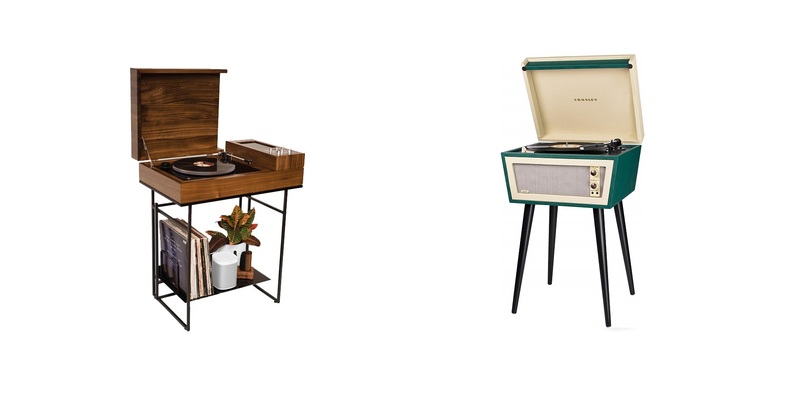 Equal parts throwback and modern luxury, the walnut-hewn Loft spits out both the groovy tunes from your limited-ed vinyls and the latest hits from your streaming service of choice via wifi and smartphone app. “Travesty!”, some may cry, disdainful of marring the analogue with the digital. To which we reply: think of this as an education, a chance to showcase – and enjoy – the strengths of both mediums, as and when you want it. There’s a bunch of synergies with Sonos systems you can check out alongside the product page here. $4120 before shipping. Minimalists are going to love this one. The Kickstarter-driven LOVE Turntable is essentially a clip that sits atop your vinyl and ‘walks’ across the surface (without touching, except at the stylus). This means immense space savings as you won’t require the boxy frame of the traditional player. The LOVE is also controllable via smartphone app – and its optical sensor means you can actually select tracks. Take note, though, that it doesn’t come with speakers; you’ll have to hook it up via Bluetooth or the 3.5mm aux-in port. Pre-amps on board. Available for pre-order here. $450 before shipping. Like the Sterling, the Denim works speakers into its compact frame, albeit smaller versions that may not have as much ‘oomph’ or clarity. What it lacks in power it makes up for in portability and sheer stylishness. It plays up to 78 rpm and comes in two other denim-based textures (and a bunch of regular finishes). Perfect for bringing the life to the party, fashionably. Audiophiles be warned: for such a pocket-friendly price, we’d go light on the expectations of music quality. Reviews agree. Available at Amazon. $70 before shipping. If performance trumps style for you, opt for Music Hall’s top dog in its flagship range. Don’t get us wrong – it comes with a clean and tasteful design, but most of that dollar has gone towards generating rich, clear tones and a sturdy, reliable setup that will see you through many, many records. One of the few listings to be true to its “turntable” label, you’ll have to connect this to an amp and speakers to enjoy the top-notch delivery. Then again, if you’ve read this far, you already have that setup in place. The manufacturer does not ship – available through dealers such as MusicDirect and eBay. $550 before shipping.